Waiting on Wednesday is a weekly meme hosted by Jill over at Breaking the Spine! This is a chance for book lovers to discuss the books that they can't wait for and to also discover new books that others are waiting on! behind a wall of smoke and flame." The way Delirium ended, OH MY WORD! I seriously cannot wait to read this one!! I tried to do a review of Delirium a while back but I just couldn't find the right words to describe it, so I didn't. But I will let you guys know that I really enjoyed it!! What is your WoW pick this week? Leave me links so I can comment back! I LOVED DELIRIUM! I am dying for this. The Delirium ending broke my heart! I'm hoping for a miracle for Alex! Hi! I'm a brand new follower, and am excited I ran across you on Twitter tonight! If I were to post a WoW post, this would have also been my choice. 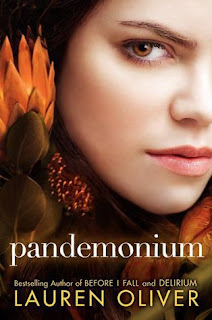 Delirium left me DYING, and I can't wait to see what's happening in Pandemonium! According to the author, though, it ends with a cliffhanger just as bad. Not fair at all! Oh. This book sounds pretty good! Love the cover! Great choice! Thank you for sharing it!! Pandemonium! Yes! a definitely must wait! I really want to read what happened next after reading Delirium eeek! I just got Delirium and can't wait to read it! I'm sure I will be begging for this soon too. I can't wait for this one either!! I read Delirium during the summer when I was on holiday in Norfolk - I loved it! As you can see from my Best of 2011 giveaway - it was one of my favourites of the year!